In 2005, after running their own successful upholstery and apparel sewing businesses for many years, John De Haan and Shirlee Harris decided to combine their skills and energy into a new enterprise called Top Stitch Manufacturing Inc.
John and Shirlee together bring over 50 years of professional, production-scale manufacturing knowledge and experience to Top Stitch, and can literally "sew it all"! From their spacious and well equipped shop located just south of Duncan, BC, Top Stitch currently handles a wide range of contract types from private, commercial, industrial, and First Nations clients - including long and short contract sewing production runs for domestic and industrial applications, the design and manufacture of custom prototypes for unique products, and furniture restoration. 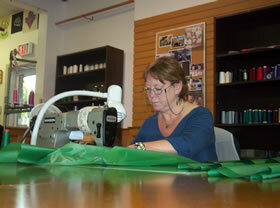 Co-owner Shirlee Harris sewing air filteration plenums for Island Clean Air.